The 2017 festival took place in a perfect weather window. The days leading up to the event were pestered with wind and rain, but the Norse gods were smiling on Jarl Mark Lawson it seemed. Friday morning was very cold, but there was no rain, and very little wind, making for an excellent day for the march from the hall to the school, and the photos were taken in a beautiful frosty and clear setting. 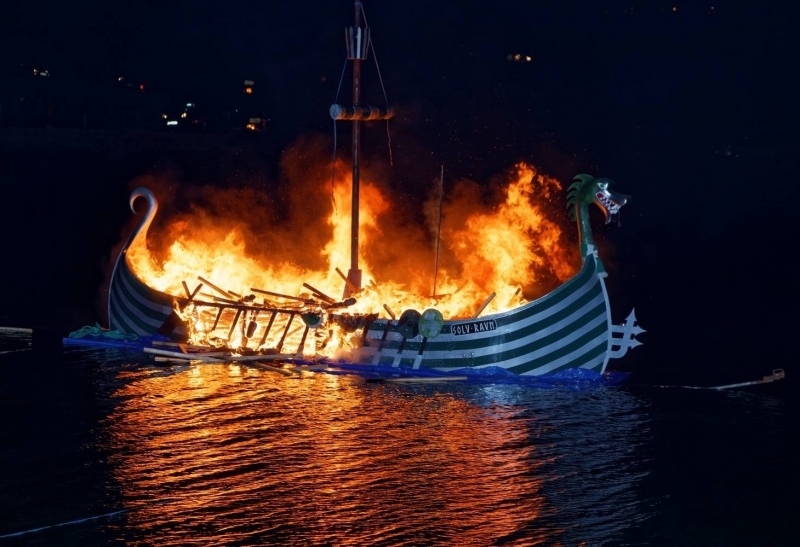 The procession was glorious with a calm dry evening showcasing the burning of the galley in a perfect fiery glow. The Jarl Squad carried torches this year, which had never been done before. It made for a great spectacle, lighting up the Galley in a way never before seen. The weather window closed shortly afterwards, with increasing winds and rain lashing, but by then everyone was inside and no longer caring. The squads were hugely enjoyable to watch, with a wide variety of performances. After the squads, and the supper, the dance begun around 1am. The James Leask Band kept everyone entertained and on the floor til the early hours.